Cleaning & organizing is something I’ve struggled with for a long time. As I indicated in this Fallible Ideas list post, things were so bad I’d literally trip over objects in my apartment regularly. I recently put some effort into fixing this problem (with a focus on the organizing part of cleaning and organizing) and I have had some success. The purposes of this post are 1) to discuss some of the thoughts I had and things I figured out during this process, and 2) to share some links to useful products I discovered along the way. This is not the first time I’ve put some effort into cleaning and organizing. So the next few sections will be about what’s been going wrong and what went differently this time. One thing that I figured out was the importance of my attitude towards organizing. Being overwhelmed is a common complaint for people dealing with messiness. I think I had some of that. I also thought I was a “messy person” as some sort of character attribute. I didn’t have any argument this was some sort of inherent characteristic, but I do think I considered it part of my identity. I also had some direct personal exposure to people who would use excessive cleaning as a time-waster in order to avoid addressing the real problems in their life. I think this experience contributed to a negative attitude towards the topic. In order to change my attitude, I had to focus on the very concrete benefits of getting more clean and organized, and do so repeatedly over time. So I had to regularly pay conscious attention to the benefits of finding stuff more easily, not tripping over stuff, etc. I also had to keep in mind the idea that messiness is a lifestyle, not an inherent attribute. One big issue I had was not questioning existing uses of space enough. I wasn’t checking my premises. As an example, I was not questioning whether a certain kitchen cabinet necessarily had to be the place where I store my baking ingredients, and instead just took it as a given. This attitude is especially weird given my space wasn’t organized as part of any rational plan. My existing organization had developed in a haphazard way — dealing with the mess of the moment — and was proving inadequate. Yet I was respecting these haphazard and inadequate uses of space as if they were inviolable commandments (“And the lord said: the spreads shall be in the rightmost lower pantry shelf.”) This is part of what lead to ongoing cycles of repeated cleaning followed by a return of messiness. Since I wasn’t really reconsidering how I was using my space, the undesirable cycle just kept repeating. I find that now I often have various reorganization ideas “simmering” on my mind’s back burner and that I often wind up pursuing these ideas with great energy once they become clear to me. This is very different than my previous attitude! Another mistake I made is that I wanted cleaning and organizing to be a mental autopilot, low attention task. I don’t think this is unreasonable per se — cleaning often can legitimately be a task that one does while thinking about other things (similar to walking or various other low attention activities). But it is unreasonable to try to do cleaning on autopilot if has ongoing problems with cleaning! Ongoing problems means there is a need for ongoing mental attention to the issue — the autopilot level effort isn’t doing the job! Opportunities to clean and reorganize stuff is now something I’m actively looking for. I’m paying way more mental attention. I also prioritize it more. I will now take 5 minutes to do a bit of reorganizing or wipe something down if I see an opportunity, instead of putting it off for later. I had a kind of disrespect for the whole topic of cleaning and organizing. I didn’t want to pay attention to cleaning and organizing because I didn’t think it warranted attention. I considered it a dumb/annoying topic. So I disrespected the problem and didn’t put forth the amount of energy/thought/attention/effort it would take to solve it, and so of course it didn’t get solved. Focusing on the practical benefits of a clean and organized house helped here. Another thing that helped was breaking down my issue more precisely into two aspects. There is cleaning, which is mostly kind of tedious, and there is organizing, which is a more interesting conceptual/abstract problem that can actually be fun. So I focused on the organizing aspect more, and for the cleaning aspect I just tried to reduce the friction as much as possible. This helped in a few ways. First, being able to find any aspect of the problem interesting — whereas before I had found the whole subject matter tedious — was a big help in terms of being able to get my mind actively engaged in thinking about the issue. Second, getting more organized actually helps make it easier to clean! E.g. by doing cable management and replacing some surge protectors with desk-clamping models (see below for details), I was able to get a bunch of corded mess off my floor, which makes it easier to vacuum. Third, separating out the (less interesting) cleaning aspect from the organizing aspect, and approaching it in terms of friction-minimization, let me formulate a plan of action with regards to cleaning. So in terms of friction-minimization actions, I’ve done stuff like strategically deployed disposable cleaning wipes at locations where I know I will need them, and purchased a cordless vacuum that is easier for me to use. My standards for what counted as clean and organized even when I did occasionally put in some effort were very low. Roughly, I would do something closer to organizing a mess into piles instead of getting rid of the piles themselves (by finding a permanent home for things, throwing things out, whatever). Organizing piles helps some, but it is more of an intermediate step than a complete solution. One very concrete example of implementing higher standards is this: at one point I was thinking about getting a Roomba. So I tried to see if I could get my floors “Roomba ready”, which meant getting them way cleaner and more organized and not having loose stuff on them. I wound up not getting a Roomba, but having way less messy, organized floors is helpful for even regular vacuuming. Having the “Roomba ready” goal to organize around gave me a concrete standard to shoot for, and that was helpful. I’m now going to go through some products I discovered that helped me to get more organized. I am a big fan of magnet hooks. They let you hang things from places where there is metal, which can be very useful. Here’s a link to some examples of how I’ve used them. The stronger ones can be nicer because you can put more weight on them. Stronger magnets are more expensive. I particularly like kind that has a bigger swivel hook (this is an example, though I haven’t bought this specific brand), cuz I find it easier to hang various sorts of things from them. However, you have to be careful with the actual hook park, since I have found that the big swiveling hooks tend to detach more easily than the fixed short ones. You need to be careful with magnets, and especially careful when initially removing them from the box they came in. They might pack two magnets with just a thin amount of material between them, and it’s easy to accidentally get magnets stuck together. It can be really hard to unstick them. There are tons of different things you can get that hang over the door and can help you organize better. Some options include baskets, shoe racks, and hooks. I am using all of these. I find the shoe racks especially helpful cuz shoes can really take up lots of space otherwise. If you’re considering one of these, make sure it will fit your door. If it’s a big thing like a shoe rack or long basket, you may have issues with the door handle, particularly if it’s the lever style (as opposed to knob style) which is more popular these days. Also be aware that some over the door things can rattle on doors a bit when opening/closing the doors if they aren’t secured against the door somehow. Bins come in all shapes and sizes and are great for organizing things. Stackable bins can be particularly useful. You can find bins from Amazon, your local dollar store, or places like the Container Store. I have a variety of bins from all these places. I won’t go into lots of detail here cuz there is such a variety and your needs will vary a lot. I will mention that I especially like these White Stackable Bins from The Container Store because they have joiners that hold the stack together with more stability than lots of other stackable bins. Carts can be really great for organizing things. I’ve got three of these Seville Classics brand carts from Amazon. They’ve got tons of storage capacity, are cheap, and are very easy to set up. Since the whole thing is lightweight and the drawers are plastic, it’s not great for storing heavy items. But for fairly lightweight things it’s very useful. I also got one of these craft cabinets to put on top of one of the carts. It’s great for storing little things like screwdriver bits. The cheapest and simplest way to get some order to your cables is to just use plastic twist ties, e.g. something like these. They’re cheap and can be used to to hold together extra unneeded cord length on your desk so that those cords aren’t loosely flopping around and getting twisted up with other stuff. Another useful thing are something like these cord organizers. They have a top that holds cords and a sticky bottom that holds the thing in place. These are good for routing cords in a specific path around your desk. Rubber twist ties are an upgrade from the plastic ones. Because they are stronger, they can hold together bigger/thicker cords, and can be used in other ways (like tying an object to a shelf, or hanging off a magnet hook so you can hang something from the hook that you normally wouldn’t be able to). One thing I found very useful in freeing up desk space was my discovery of surge protectors with a clamp. Not only do they free up space and improve orderliness directly by moving your surge protectors from the desk (or floor) to the side or back of your desk, but they also help with cable management, since they kinda serve as an anchor that helps draw cables away from the areas you don’t want them to be in. 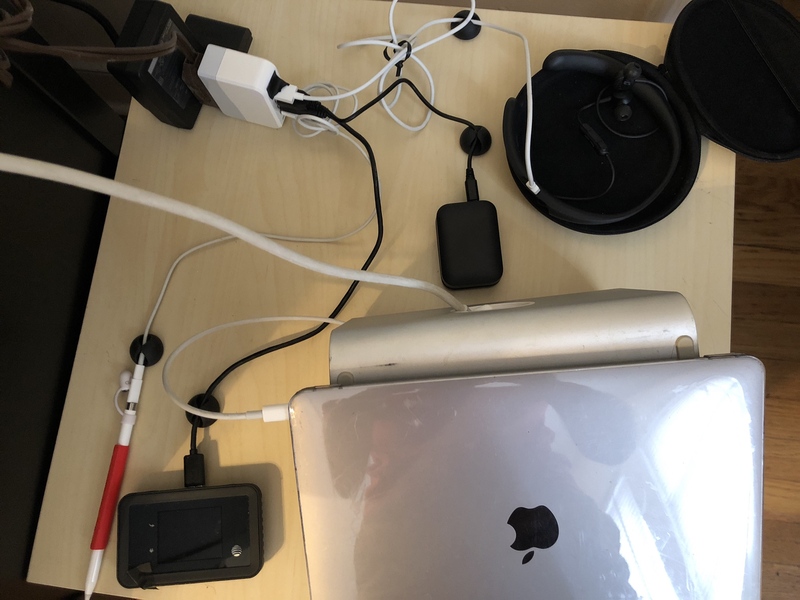 The specific model I linked also has built in USB charging ports, which was helpful for me because it meant I needed to have fewer USB charging plugs out. There is lots of helpful advice out there for organizing and it can be very helpful. But I think to succeed, you really have to think of your own use cases and organize around that. Other people’s organizational systems are great inspiration that you should borrow from, but you have to make them your own. One example: I have a bunch of electronics I need to charge regularly. And I wanted them to be in the same place so I wouldn’t forget to bring one of them when going out for the day. So I used a small Ikea table and some cable management to help set up a charging station for my various small electronics, and it has worked nicely. I’ve liked Mr. Clean Magic Eraser for cleaning my white walls and some other stuff. I recently purchased a Dyson V8 Animal+ Cordless Stick Vacuum from Costco. I’ve barely used it so far since I just got it, but I like it so far. I had a more conventional corded vacuum but dealing with the cord annoyed me a bunch so I wound up not using it much. I can definitely see myself using this Dyson vacuum much more. It’s light and easy to move around and has various attachments that seem useful. One issue with cordless vacuums in general is they have a relatively short run time. The one I got has 40 minutes of runtime at the normal settings and 7 minutes on maximum suction. 40 minutes seems plenty for my use case, which is a fairly small apartment. One issue with this particular model is that it doesn’t come with a hardwood floor-specific cleaning head (you have to upgrade a model tier to “V8 Absolute” or buy it separately). I read reviews online which said the included Direct Drive Cleaner Head is fine for both hardwood and carpet, and it seems fine to me on my hardwood so far.